1. How many such pairs of letters are there in the word BEHAVIOUR each of which has as many letters between them in the word as in the English alphabet? 2. How many such digits are there in the number 764528 each of which is as far away from the beiginning of the number as when the digits are arranged in descending order within the number? 3. What should come next in the letter series given below? 4. How many meaningful English words can be made with the letters EPRY using each letter only once in each word? 5. J, D, L, H and F each travelling to station, each one reaches at different time. L reaches only after J and D reaches only before F. Who amongst them is third to reach? 6. Four of the following five are alike in a certain way and so form a group. Which is the one that does not belong to the group? 7. In a certain code ALIVE is written as WFHBM. How is VALUE written in that code? 8. The letters in the word DANGEROUS are changed in such a way that the consonants are replaced by the previous letter in the English alphabet and the vowels are replaced by the next letter in the English alphabet. Which of the following will be the third letter from the left end of the new set of letters? 9. Four of the following five are alike in a certain way and so form a group. Which is the one that does not belong to the group? 10. Four of the following five are alike in a certain way and so form a group. Which is the one that does not belong to the group? 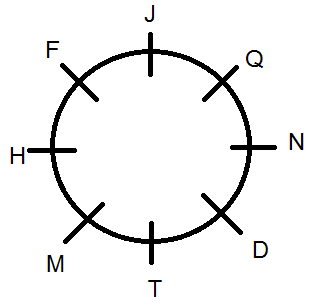 M, D, J, Q, T, F, H and N are sitting around a circle facing at the centre. T is third to the right of F who is second to the left of M.Q is not a neighbour of T or F and is third to teh left of H. J is second to the right of N.
11. Who is second to the left of H? 12. Who is to the immediate left of M? 13. In which of the following pairs the second person is to the immediate left of the first person? 14. What is Q’s position with respect to M? 15. Who is second to the right of T?